The issue prepared did not include all the reports at the conference as many authors who participated has just outlined their research interest and did not bring their work up to the end. At present stage of our joint work we did not formulate the task to illustrate all the aspects of interstate, diplomatic, political, economic, cultural, educational links and resulting representations of African and Russian peoples. That did not allow us to divide the issue for the thematic parts. First of all we tried to outline the principle periods in formatting these representations (A. Davidson). Vast archive materials enable us to realize the specific development of interstate relations between Russian Empire and Ethiopia, the only independent state in 19th century at African continent (G. Tsypkin). To this edge of 19—20th centuries belong the contacts between the sailors from Rozhdestvensky fleet and the Africans in different ports of West and Sothern Africa (A. Kozvonin) as well as the impressions of Russian migrants who were trying to overcome difficulties in the southern part of the continent (A. Balezin). One more important side of Russian-African relations was and still is the history of the publications which develop the image of African personality especially when we deal with such charismatic figure as K. Nkruma (S. Mazov). Through all the periods of Russian-African relations our country was rather often an object of strict attention of the Africans who travelled here (M. Kurbak). And those African-Americans who lived here for a long time added much to the store of mutual representations of black and white peoples (N. Scherbakov). Today the accumulation of mutual representations is going on not less intensive due to the expanding educational relations especially in the last years (A. Voevodsky). 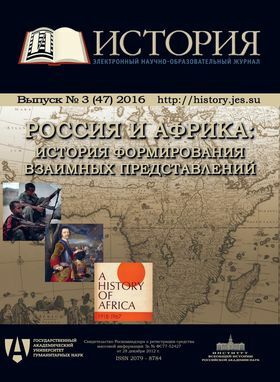 All the authors of this issue are using numerous archive materials and other documents and issues which enrich the complicated outlook which characterizes the establishment and development of African image with Russian peoples and the image of the peoples of Russia in Africa. We continue the work on the theme highlighted in this issue. In the coming period we hope to enlarge the number of authors and the themes they dwell upon to prepare our book which will show the comprehensive history and modern state of mutual representations, mutual evaluations and prospects for the development of relations between the peoples of Russia and Africa.